It is possible that you may have errors in your writing i.e Grammatical or in spelling even if English is your native language also if English is your second language then probably you might make many mistakes in your writing. So for this purpose a lot (almost hundreds) of websites are build which enable you to proofread your writing & documents for mistakes. So if you are looking for these tools then in this post we are with the list of 7 best among these. Online grammar and spell checker tools helps you either you’re a freelance writer, blogger or a student. Or let suppose you received a document from your friend and want to check it from the grammatical and spelling mistakes then these web-apps will help you a lot. Now let have a look to our today's collection of free online tools that can be used to check your documents, articles and writing from grammatical and spelling mistakes and to get suggestions for it to correct it. Polish my writing is one of the best online tools that check spell and grammar mistakes in your composed text and gives your suggestions for that mistakes. Isn’t this a great tool? Checking your grammar and spell with this toll is so easy and straight forward, here what you have to do to copy the text which you want to test, and paste into the text box at polish my writing website. After pasting the text, click on “Check writing” button below the box. If it detects any mistake that word will be underlined so you have to click on this word to get right spelling, grammar, or explanation. Here is another great tool that enables you to make your text error free and that can be used online for free. It is also belongs among one of the best and popular tool that check your spell mistakes online. What you’ve to do is to copy the text you want to check for mistakes and paste it into the box and then click on “Spell Check” button present at the top of the text box. A new window will pop up, so if it find any mistake regarding spell, grammar etc, that will be underline. Another free online tool that check your text from the different mistakes in spell and grammar as well as gives you instructions and suggestion of how it needs to be. We’re talking about Spellcheckplus, which work within your browser to catch out the mistakes in your written paragraphs. To clean and find the errors from your text using this tool, first of all you’ve to paste the text your want to check in the text box here at spellcheckplus, and then click on “check text” button at the right bottom of that box. After a short progress, if it detects any mistakes, the words/sentences will be highlighted with the yellow colour. Hover your mouse on the highlighted area to get suggestions that what need to do. This is an advanced online tool that let your find mistakes in your writing that is of spelling or grammar, Use this one to check long articles, essays for spell and grammar mistakes. It also gives you suggestions about the title, body and other parts of your paper. Noun Plus is an online tool that will look at your writing and will search for any mistakes if you made in spell or grammar. And this process will be done for free. After you pasted the text into the text box and clicked on the appropriate button, you will see your text two time on your screen. If it detects any mistakes in grammar, this will correct it and you will see it at right side. The corrected text will be highlighted with different colors. This is a great and powerful online proofreading tool, that make a look at your text and highlight the word(s) which are wrong in the rules of grammar. In addition, it also give you suggestion that what need to be here and why? To proofread your writing with this tool, paste the text in the box provided here in the text box provided. And then click on “check text” button. So you will get the result. If you find a word highlighted with green colour, hover your mouse on this and see their suggestions, what need to be here. you can make use of grammar base to check your writing for grammar errors and get suggestions for it. In order to proofread your text with this web-application, copy and paste your text into the text box and then click on “Start checking” button at the top of this box. After a short process of checking, the words with error will be underlined so you’ve to hover your mouse on it to get suggestions. So above, we shared some best and free online spell and grammar checker tools, i hope these will be hlepful for you. Also do share this post with your friends! Comments related to this post are highly appreciated! If you know about any other free grammar and spell checker tool that is not listed above and you think is useful then please share it with us in the comment box here. Your post is very informative and appreciating. 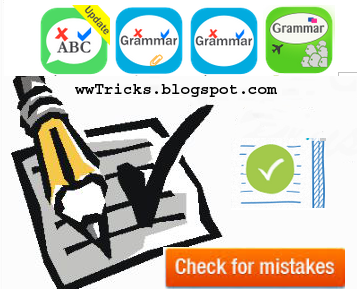 Grammar checker tool is helping us in various ways like those children having problem in spelling and grammar problem by using this tool they can overcome this problem very easily. Thanks for appreciating the post & dropping your valuable comments. Of course, online grammar checker tools helps a lot & solve the problem easily because these works within the browser! Ahh... so there is a place online where one can check his grammar, that's indeed awesome. I glad to see you here and thanks for the appreciation. Yes there are lot of olnine grammar checker tools available on internet that check your writing for grammatical and spell mistakes. In this post, we listed some best examples of those. Really You are doing great job because now-a-days most of the peoples are facing various kinds of hindrances while speaking and writing English. So, you have suggested many kinds of grammar checker tools to solve these problems. One day while surfing internet I got a free grammar checker tool (nounplus.net) which is also free of cost and can help us in numerous way to rectify that grammatical errors. I found this tool very helpful. Thanks for coming back Sae! I glad to hear that the collection of grammar checker tools was useful for our readers! Also thanks to you for mentioning another best tool!